Following a successful crowdfunding campaign for an all-woman Lovecraftian anthology Silvia Moreno-Garcia and Paula R. Stiles began the work of gathering stories, besides those already booked at the start of the project, and artwork for “She Walks in Shadows”, the title of this collection. 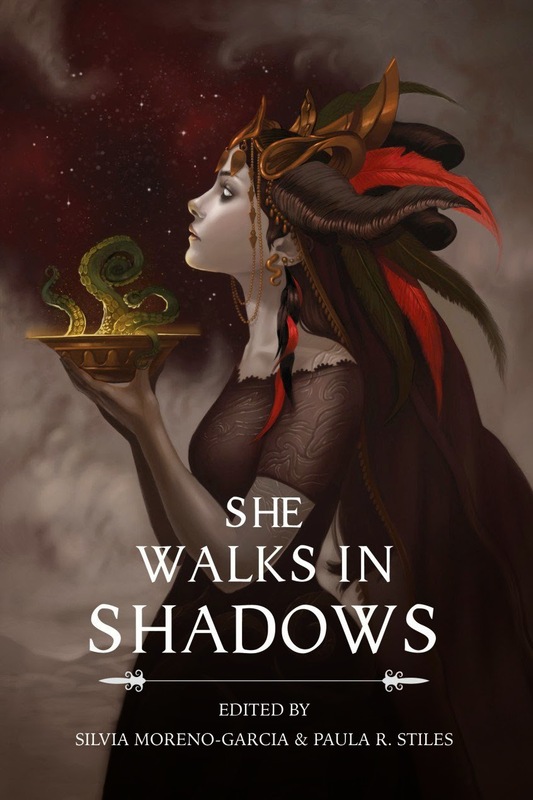 With all the latest rise of Lovecraftian fiction “She Walks in Shadows” is the first all-woman anthology dedicated to this sub-genre, a welcomed addition to the powerful collections and stories already published so far. Of course, plenty of those were written by extremely talented women, but this time they rightfully have the stage for themselves. For me, this anthology held promise even from the early days of its crowdfunding campaign. My experience with Silvia Moreno-Garcia’s editorial works, and not only, was nothing but rewarding. The presence of Angela Slatter, Gemma Files, Molly Tanzer, E. Catherine Tobler and Benjanun Sridungkaew on board of the project from the early stages of “She Walks in Shadows” was another point that bolstered my faith in this anthology. I cannot say that after the revealing of the full table of contents many other names ring a bell, but that never stopped me from giving such authors a fair chance. After all, how could I add writers to my list of favorites if I am not open to the ones with whose works I am unfamiliar? As a lover of beautiful artworks I was also thrilled to see this project boosted by interior illustrations, I am not the one to hide my love for the glamorous volumes containing excellent artwork next to wonderful fiction. It seems I’d count “She Walks in Shadows” among these volumes too, since the first glimpses of the interior illustrations are alluring and that without mentioning the awesome cover artwork made by Sarah K. Diesel. All these elements, the take on Lovecraftian fiction, two experienced editors, 24 authors from around the world and 10 artist covering the cover and interior artwork, promise to make “She Walks in Shadows” one of the highlights of my 2015 reading year. The anthology is due to be released on the fall by Innsmouth Free Press, but I am certain that Silvia Moreno-Garcia and Paula R. Stiles’ collection will worth the wait. Reminds me of Edea from Final Fantasy VIII.